Google has started rolling out a new Android feature Instant Tethering to Pixel and Nexus devices the feature lets you share a cellular data connection between certain Pixel and Nexus devices via Wi-Fi when they’re signed into the same Google Account. The feature is a part of the new Google Play Services and uses Bluetooth to negotiate the connection. 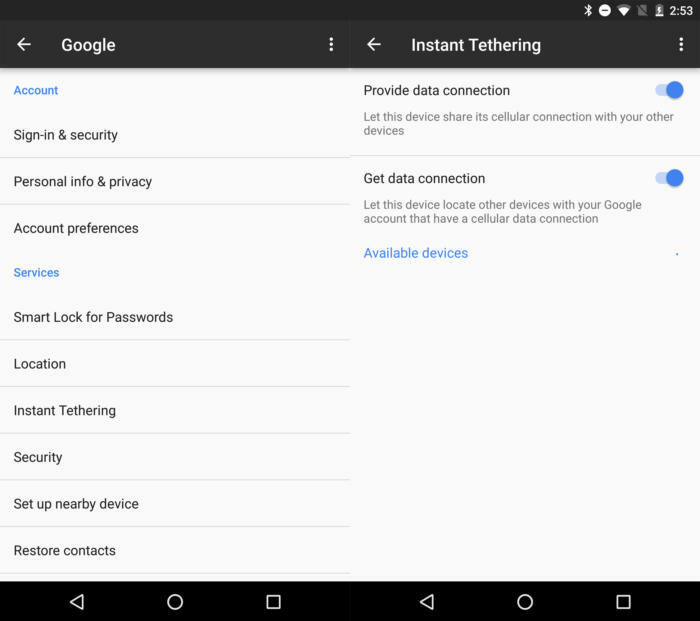 To access the feature, you need to head to Settings>Google> Instant Tethering menu. Google says this feature is enabled by default on all compatible devices, through Play Services. 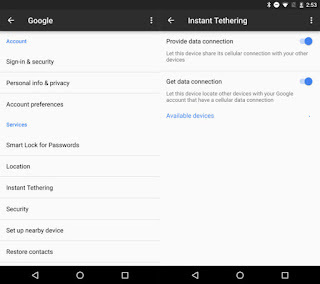 Users of Pixel, Pixel XL, Nexus 6, Nexus 5X, or Nexus 6P running Android 7.1.1 will be able to access the new Instant Tethering feature. On the other hand, the receiving device will need to be a Pixel, Pixel XL, Nexus 6, Nexus 5X, Nexus 6P, Pixel C, or Nexus 9 running Android 6.0 and up. Google’s Product Manage, Omri Amarillo wrote in Product Forum, When you unlock a tablet such as the Pixel C, it will notice if there is no internet connection available and will ask your Pixel phone if it has internet and battery life. If it does, we will give you an option to enable a secure hotspot and pair automatically, without even taking your phone out of your pocket.